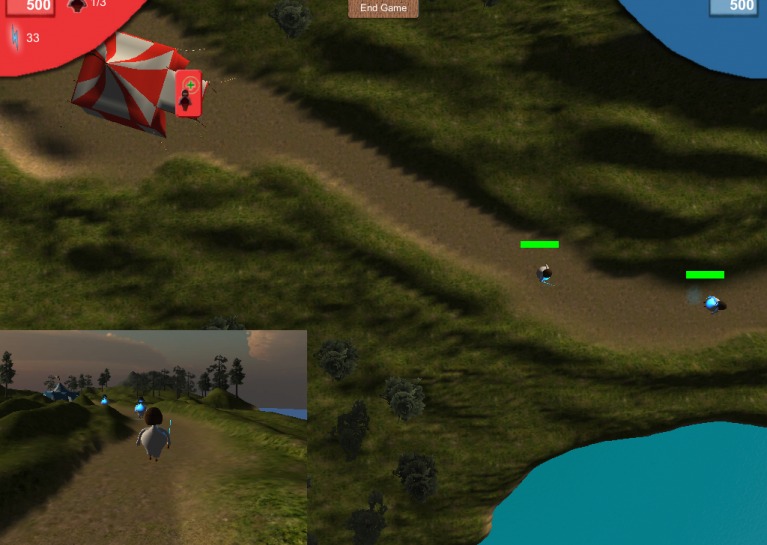 Global Game Jam 2014 Postmortem | Geometry saves the Earth! 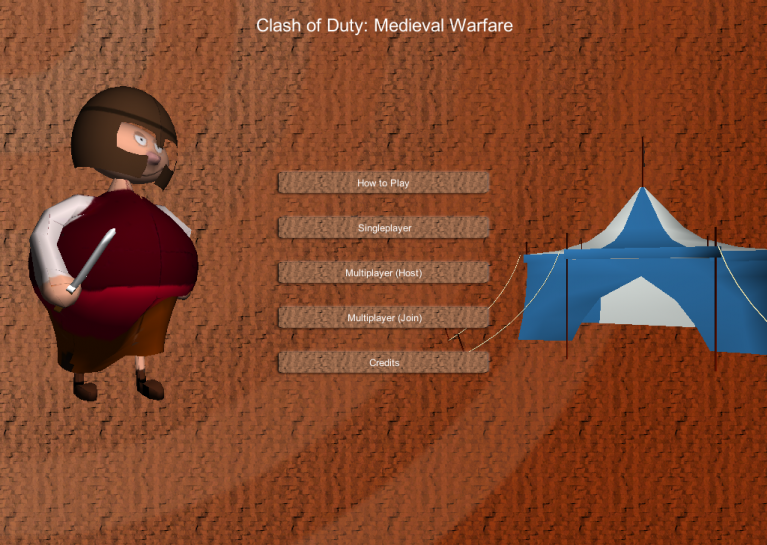 “Clash of Duty – Medieval Warfare” is the result of the second game jam I took place in, in the context of Global Game Jam 2014. The theme that was selected in the end was “We don’t see things as they are, we see them as we are”. We had a lot of ideas floating around with this motto. One I remember is a game where you have different views on the world, in one everything is ok, in another everything is on fire/frozen/… It sounded nice, but then was still discarded when we got into planning. I had the idea of a classical adventure game where you control several characters who each interpret the same input differently, and you have to find out how to get them something. The interpretation that won out in the end is that you have a kind of tower defense game where you know can send several types of mobs. You know the properties of your mobs, but you don’t know those of your opponent. When they clash with each other, you can find out about them. But I have to admit, I think we got carried away so far that it’s really hard to find the theme in the game. My role, again after Ludum Dare 27, was asset creation. The major part was creating the characters and some props. A teammate had created the environment in Unity, only some parts had to be added. The main menu features almost all of the art I created for the game. After we had decided for a comic-medieval setting, I started to set out with the characters. This work was mainly done at night during the first night of the jam, and the major part was getting an idea for the character. I wanted to do everything from hand this time, and so finally I decided to take an existing sketch of a Don Quijote’s Sancho Pansa as a comic character, sketched over it and added a side and top view for modelling. In Blender, I started out from a sphere (because he was intended to be rather heavy) and created the rest of the model from this. The helmet was created from a separated copy of the faces of the character’s head. Finally, I rigged this model and painted a texture on it. Considering that this was the first time I did it almost from scratch and did not use a pre-existing mesh as the basis, I’m pretty happy with the model even though it’s far from perfect. Especially the UV-unwrapping went awry a lot. You can see the model on my p3d.in account: http://p3d.in/L3KZC. The major remaining parts were the tent and the fences along the side of the path of the mobs. For the tent, I got a reference picture off the web and made sketches of it in the way I wanted to. The modelling worked really nicely and I felt in flow, getting a tent I’m really happy about, done in a relatively low time. I applied a lot of new techniques I learned during the jam in there, for example making the rounded shape of the tent’s roof using proportional editing and using the array modifier for the bordure of the tent. The result also (in my opinion) looked a lot more finished than the character. The fences were similarly easy. Have a look on p3d.in: http://p3d.in/WXh9l. The flag used in the game. I took a nerdy detour looking into heraldry to build a flag for the tent. We even had them set up as physically simulated cloth for the intro, but this feature didn’t make it into the game in the end. It was a nice learning experience but, compared to the other work I did, didn’t have that much impact on the final game. In the end, we were again happy to get something working out of the door in the 48 hours, 24 less than during Ludum Dare. Again, we lost the focus on the theme a bit, but I think that’s not a very uncommon thing happening during a game jam. On the difference between Ludum Dare and GGJ, I far prefer Ludum Dare to GGJ. Even though there was a lot more organization before GGJ as compared to Ludum Dare, GGJ for us ended immediately after the deadline. Compare this to the voting period of Ludum Dare, which increases feedback from the community vastly and which is large part of the fun for me. You can play the game from the Global Game Jam page. Try it for yourself!